MTP Cassette, as an easy-to-install and cost-effective plug-and-play cable management solution in today’s fiber optic cable patching system, is used to interconnect MTP backbones with LC or SC patching. 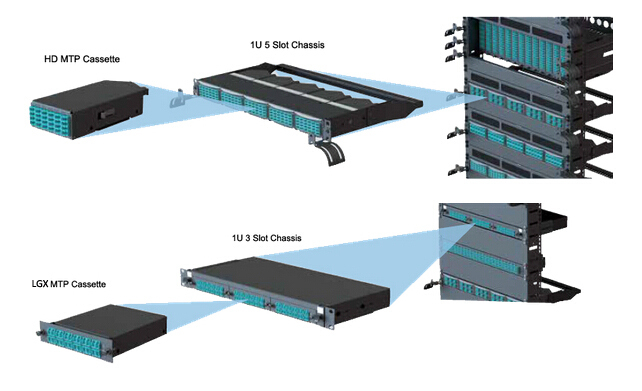 Providing secure transition between MTP and LC or SC discrete connectors, they allow for rapid deployment of data center infrastructure as well as improved troubleshooting and reconfiguration during MACs (moves, adds and changes) by being mounted in 1U or 4U 19″ multi-slot chassis. The MTP LGX cassette, HD cassette and TAP cassette are variants of the MTP cassettes. They have similarities but also have their own unique features. As such, many users are confused by them during purchase. This post is going to understand the similarity and difference between them. As mentioned above, the three kinds of MTP cassette have something in common. They all contain factory pre-terminated and tested MTP-LC fan-outs to deliver optimal performance and reliability. Low loss MTP Elite and LC or SC Premium versions are offered to feature low insertion loss for demanding power budget high speed networks. I will present their differences from three aspects in this section. The package is the most obvious difference to distinguish LGX cassette and HD cassette. The former is designed with the standard LGX package, usually being mounted in a three-slot chassis. While the HD cassette is more compact, which can be mounted in a four-slot or even five-slot chassis so that is more suitable for high-density applications. In addition, the HD cassette can be also designed with the keyed LC adapters, which help reduce unauthorized connections in the key network. It is noted that TAP cassette can be designed in LGX and HD packages. As we know, the main application of MTP cassette is to achieve fast and easy patching between MTP backbone and LC patching. But for TAP cassette, except patching application, it is specially designed for network monitoring. Because there is a splitter in the TAP cassette, which can help achieve a complete copy of all traffic between two devices, for test and access purposes (click here to learn more about TAP cassette). Between these three kinds of cassettes, TAP cassette is the most expensive one as it has not only the patching function but also the monitoring function. HD cassette is a little more expensive than LGX, because of the compact design and premium adapters. But actually, as the market continues to mature, LGX cassette and HD cassette are offered in a close cost by some vendors, e.g. FS.COM. MTP cassette of LGX, HD and TAP are all widely used in today’s data center network to meet different demands. If your cabling system is not a high-density one, the LGX cassette can meet your demands in general. If you wanna to deploy it in the high density and ultra high-density environment, you should choose the HD type. Of course, TAP is your preferred option when you require monitoring the data traffic. This entry was posted in Cables Management, MPO/MTP Cassettes and tagged cable management, fiber optic cable, LGX cassette, MTP cassette, TAP cassette. Bookmark the permalink.